If you're looking for quality enduro motorbike insurance at a competitive price, then Bikesure, the specialist motorcycle insurance division of Adrian Flux, can help you. We have a range of schemes designed for all types of off-road bikes, and, as a specialist broker, all our rates are designed around your needs and offer the cover you want at a price you'll find appealing. Use our online quote system right now to compare enduro insurance quotes from our panel of underwriters and choose the one that suits you best. Whether you enjoy green laning, motocross, trials competitions or other off-road motorbike pursuits finding a reasonable off road bike insurance quote can be somewhat difficult. One problem is that a lot of insurance companies see bikes designed for off-road use as inherently risky, but we know that that is not necessarily the case and that in many circumstances enduro bikes are actually safer, due to the type of people who ride them. When you take out an insurance policy from Bikesure, you can be confident that the policy matches your needs as an off road motorcycle owner. That's because we have access to an array of specialist insurance schemes, many of which have been designed purely for off-roaders. And if you have zero no claims bonus, don't despair. Whatever the reason for your lack of discount, you can usually get a quote from us, and we can also offer convicted rider insurance for riders with motoring convictions or criminal convictions. What's more, when you use our online motorbike insurance quote and buy system you can instantly compare supermoto, enduro or dirt bike insurance quotes selected from the several available and then choose which one is best for you. If you like the price you see you can buy online, or speak to one of our knowledgeable underwriters to take up the policy or discuss further options. Because our enduro bike insurance is tailored to your needs, you can choose additional features which will benefit you most. Owners of road legal bikes can benefit from comprehensive, TPF&T or Third Party Only Cover, but bikes that are not road legal can still be covered in the garage on a Fire and Theft basis. Every policy comes with £100,000 of free legal cover, but we also offer optional add-ons including personal injury cover and comprehensive breakdown cover. 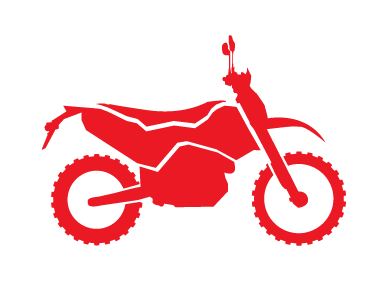 There are a wide range of discounts available to owners of off road bikes, many of which are only available on the phone. Enduro owners can get our best deals by calling us on the phone - that's because we can take individual circumstances into account to reduce the price you pay. Our highly trained staff can take and less rigid approach than a computer, and answer any questions you might have and advise you on the features available from your policy. "When I bought an enduro bike to go with my standard road bike, my existing insurer refused to cover it. Thankfully Bikesure had no problem with the style of bike or the fact that it has a kick start with no ignition. They gave me full enduro bike insurance, and even reduced the cost because I had full no claims discount on my other bike." Adam is 26 and comes from Lincoln (LN1) and has a road legal Husqvarna TE250. He has a category A licence (Passed in 2011) and has owned the Husky for a year, earning one year's no claims discount in that time. Adam's rate is just £163.16 for fully comprehensive cover, or only £136.32 for TPF&T protection. Barney is 38 and from Keswick in the Lake District (CA12), a great place to own an off-roader. That's why he bought himself a road legal 2009 KTM EXC-R 530 for £4,500. Barney has held a full motorcycle licence for 10 years, but he has just bought the bike and does not have any no claims entitlement available to use on this policy. He intends to explore some of the Cumbrian green lanes at the weekends. Barney's rate is just £225.01 for fully comprehensive cover, or a mere £98.35 for Third Party Only.